My mirrors are stunning. Working with Mary Ann and Jay was a delight from the beginning of the project until the end. They offered me many options and stayed in touch with me to design a beautiful creation. I highly recommend them. 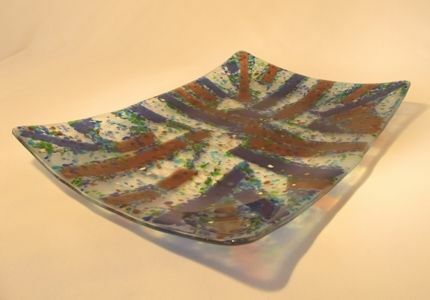 Cut glass and ground glass (frit) are the basic materials for this fused and slumped glass platter. The customer wanted violet and purple colors, which Jay laid out in strips accented by smaller bits of ground glass. After the glass was fused at about 1450 degrees, it returned to the kiln to be slumped over a mold at a lower temperature. Gentle curves in the 12" x 17" platter are just right for serving cold fruit and cheese or hot entrees. Between meals the platter looks beautiful in the center of a handsome table or sideboard. It could also be mounted on a wall. Every maker has a story. Be a part of Paulukonis Studio's story by placing an order, leaving a review, and seeing your review appear here.